Eee! My little tiny garden is growing! 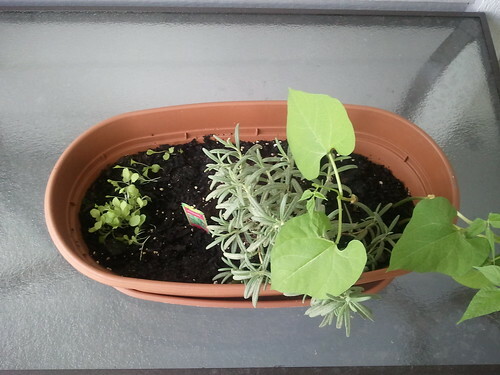 Lettuce, rosemary, and pinto beans. I didn't sew at all this week because of this guy. He's taking 2 different medications via syringe that need to be given 5 times a day. He has to wear that poor cone that he hates. And our biggest difficulty is getting him to eat...he refuses cat food, so the first few days we had to hand feed him canned chicken and baby food. Good thing he's still cuddly. 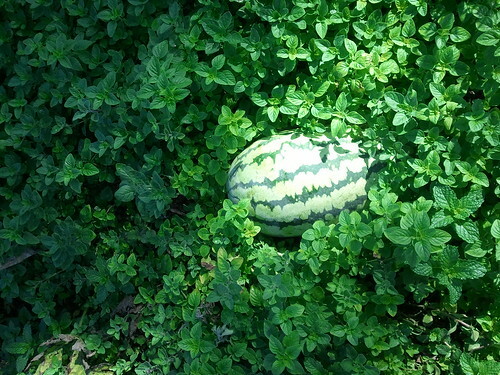 We harvested this watermelon at one of the neighborhood centers that my program works out of. Sitting in a bed of mint and basil and some weeds. 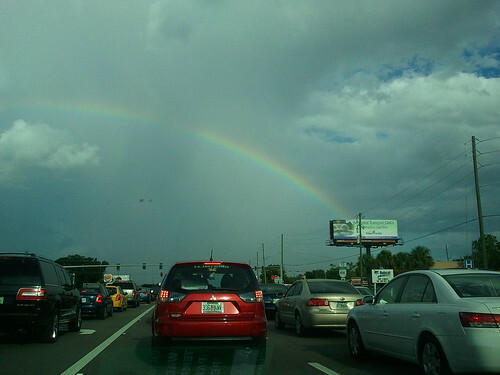 Started my weekend off right with a rainbow on my commute home! And yes, my car was stopped for this photo. My cat got hurt earlier this year and he had to have surgery and he was suppose to wear a cone too but instead, I used a baby t-shirt (newborn size probably). This way, he could move and clean himself but he could lick where he was hurt.. maybe you could try that too ? 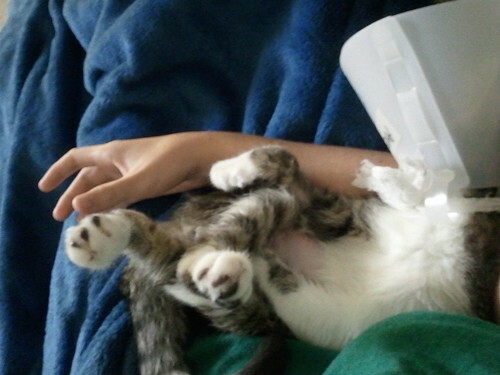 He couldn't lick where he was hurt.. made a little mistake ! My kitty had a little tank top when he was sick too, rather than a cone. I actually think it might have been a rolling pin sleeve with armholes cut in it. He looked like he was thuggin' hard. I feel for you though. Hell hath no fury like a cat taking medicine! Not in the swap, but these are great ideas, I'd love to see them made up.